Toyota Rav4 EV Forum • View topic - Tesla Branded g48 coolant?!!!! Post subject: Tesla Branded g48 coolant?!!!! "3 Gallons of Genuine Tesla G-48 coolant. Free shipping in the lower 48. No shipping to AK or HI"
Try this link, both specifications are available. Personally I prefer the G-48 (OEM BMW fluid) to both the G-30 (OEM VW G-12) and G-05 (OEM Mercedes, Chrysler, Ford). The G-30 is basically the same as DexCool. The G-48 is nitrite-free, which means unlike G-05 it can�t be used with wet sleeves. G-05 has a smidgeon more silicate than G-48. And its availability in North America is thin, indeed. Valvoline suggests using G-05 to replace it. Post subject: Re: Tesla Branded g48 coolant?!!!! I have a lot of experience with solar hot water systems. With those systems we use a food grade coolant. Many local codes require it to be food grade in case it ever contacted drinking water. The food grade version uses Propylene Glycol. The Tesla, Toyota, Nissan fluid uses Ethylene and Diethylene Glycol. A lot of fluids will transfer heat fine. What's important is the additive package, for corrosion control. For something that, under normal circumstances, you only replace every 50k miles, I'm not going to bargain-hunt. Neither one is going to corrode. You don’t have to bargain hunt but you can be an aware consumer. These two fluids are one molecule different. One is safe to drink the other is not. The only difference. They both do the same exact job. Do you know the silicate and nitrite loading of your food-grade coolant, and how it compares to G-48? I love propylene glycol, but it's not the fluid that comprises the entire spec of G-48. Thanks for the input. Can you elaborate on the silicate and nitrite loading? I can see where you are going with the not looking for a bargain.. however, it sounds like the zerex can be used with the RAV4 EV since it mentions it can be used with the Tesla. What do you think on that? Or do you think I have to pick up the tesla branded one? Personally, I think you'd have to have a screw loose to consider putting a non-automotive tested product in your car just to save a few bucks. Sorry, I haven't been online in a couple of days. Coolant both transfers heat from one place to another and prevents corrosion from chemical decomposition and electrolysis (and, in certain ICEs, from micro-cavitation events). It also has to function as a lubricant to pump seal(s). Plain water transfers heat fairly well, but it completely fails to protect against corrosion, mineral build-up, and gradual acidification from gasket etc. leakage in ICEs. It also freezes at far too high a temperature, and is not the best sliding seal lubricant. Mfgrs have figured out how to formulate a mix of additives to water to optimize a coolant that will also damp down some of those issues. For a long time, automotive coolant was a one-size-fits-all product, and you could pick from anyone's automotive coolant and it would likely work well enough. Recently (let's say, the past twenty years), coolant formulations have diversified for new engine design requirements. Some engine mfgrs have begun using new or unusual metallurgy or mixes of metals, elastomers, and plastics with different coolant requirements. 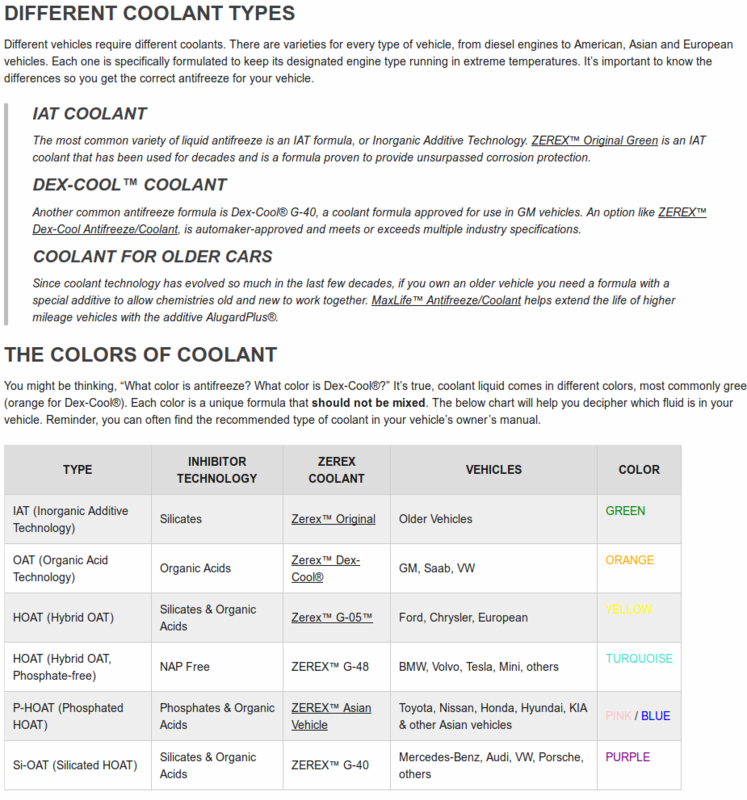 You may have noticed that coolant no longer comes only in green now, but yellow (Ford, etc. ), blue (European models), red (Toyota, etc. ), pink (some GM), orange. It's not all color-branding, these colors do (sometimes) have a purpose. It's not that you can't use one type of coolant in any old engine, but that one coolant may not protect any particular engine design as well as the additive formulation that the OEM specified. G-48 is a specific formulation. Tesla specs it, and I assume chose that formulation -- and not another -- for a reason. I am not a materials engineer, and I have limited insight into what data Tesla's engineers used to determine that G-48 is the best formulation for use in my Teslas, and I've made enough expensive mistakes to have learned this particular lesson. Having said that, I would have little reservation using one mfgr's G-48 coolant over another's. Typical green-colored coolants used to use nitrites to coat parts for corrosion protection, but this seems to not work as well with aluminum alloy brazing flux (or something like that). Organic Acid Technology coolants seek to provide this protection without use of nitrites. OAT coolants are not green (is what I'm reading). G-48 seems to be hybrid organic acid technology (HOAT), with low silicate, low pH and phosphate/nitrite free. Limiting my reading on this, a decent summary of some of the many recent coolants has been put together by Valvoline. I see I may have some of my colors<->mfgrs mixed up, above. Horses for courses; one size does not fit all. To be fair, I doubt that the reduced cost is all of Jim's motivation. Propylene gycol is a lot less toxic than ethylene glycol; it seems to work as a coolant additive very well, but is more expensive. Ethylene glycol does still kill & sicken a lot of animals every year. I used to buy propylene-based coolant just for the low-toxicity. I used AMSOil's low-toxicity passenger car coolant. It's an OAT (contains no phosphate, nitrate, nitrite, silicate, borate, amine). But because I can't find a G-48 formulation that uses propylene glycol, I would not be using that AMSOil coolant if I was replacing the coolant in my Tesla or RAV4EV. I have not found an automotive-grade propylene glycol based coolant that was less expensive than generic G-48 (though one might well be cheaper than an OEM G-48!). Well said! Exactly. I didnt use it because it was cheaper. I just have a bunch of it from solar hot water jobs. The parts in both the car, and solar hot water are similar. Plastic, aluminum, and rubber. Solar hot water systems actually use a circulator pump that is cast steel and I have never seen one rusted. Feel free to spend lots of money and time hunting down tesla fluid however there are other options that will work and are essentially identical. No need to be a purist.